I don’t really include a lot of color in my wardrobe these days – I wear a lot of grey, black and navy, and I like to think that any color come from my ~colorful personality~ (or, more realistically – my hair). But every now and then, something amazing catches my eye and I’ll bend my color rules because I can’t help myself. The key, I’ve learned, is to stick with a palette. For me, that palette means rich fall colors – deep green, burgundy red, saffron yellow, a slightly more blue blue than true navy, oh, and rust orange. Get on my body. The palette means I end up with colors I actually wear, and they mostly coordinate with one another. 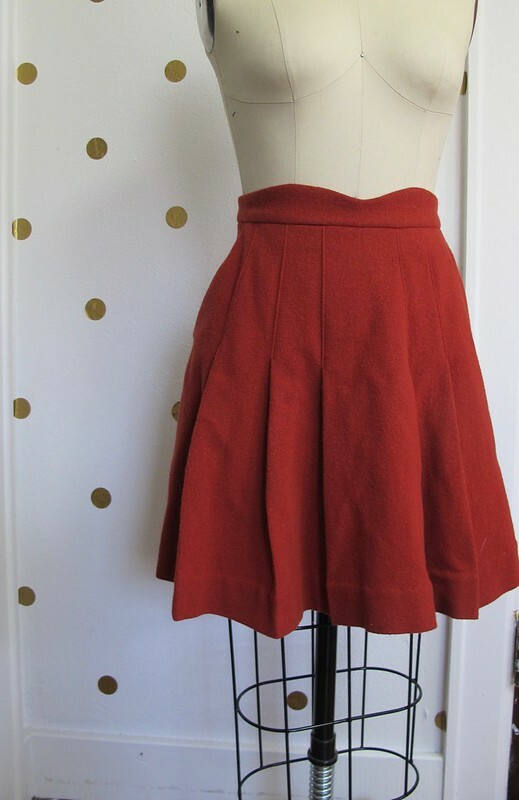 I found this rust orange wool crepe at the Mood Fabrics store in NYC, when I was visiting a few months ago. While I do prefer to go in the store with a list, it’s a pretty loose list – things like “2 yards of drapey knit for long-sleeve tshirt” or “1.5 yards of stretch twill for pants.” In the case of this fabric, I went in with a specific idea that I was going to find a saffron or rust wool crepe to make this exact skirt pattern from. I’m kind of surprised I was able to find it – Mood Fabrics has TONS of amazing fabrics, like, always, but they also manage to juuuust skirt what I’m specifically looking for – but it’s like it was waiting for me up on that 3rd floor! I also bought what was left of the bolt. Sorry. There are some really amazing wool crepes available on the website right now, though! What I love about wool crepe is how freaking easy it is to work with – and how beautiful it is to wear, both in looks and the feels. 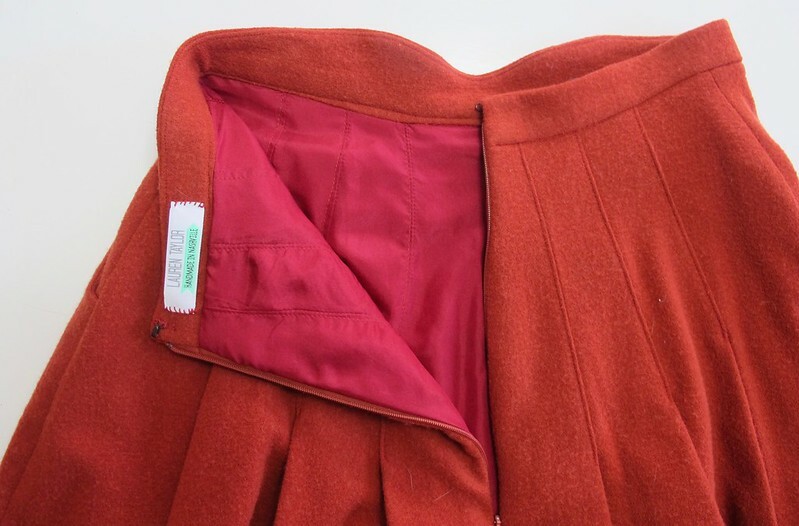 This particular wool crepe doesn’t fray, so I was able to finish my seam allowances with pinking shears. Stitches just sink right into the fabric, and you can manipulate the crap out of it with a hot iron + a lot of steam. It’s a fabric that molds beautifully to whatever you try to make it do, and it repays you by looking AWESOME and keeping you nice and warm when it starts getting cold. My skirt pattern is the Mirambell Skirt from Pauline Alice patterns. I made the size 36, and needed no fitting adjustments. 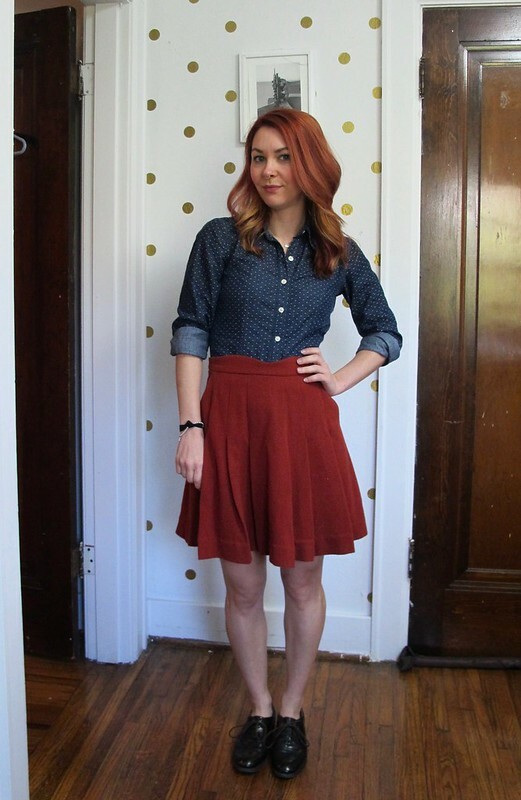 Since my fabric is a clingy wool and I knew I’d exclusively be wearing this skirt in the winter (mainly with tights – don’t let my bare legs fool ya! ), I opted to add a lining. 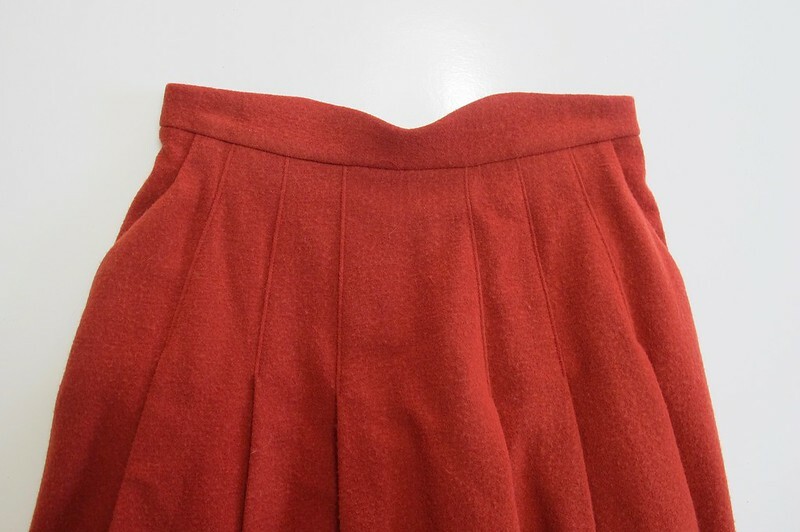 This isn’t written in the pattern, but it’s as simple as sewing a second skirt (about 2″ shorter than the outer skirt) and then attaching it at the waist before you put on the waistband. I used a lightweight china silk, originally purchased from Mood Fabrics and languishing in my stash for the past year (but what a great color match, amirite?!). In addition to keeping static cling at bay when I wear tights, the silk adds an additional layer of warmth. 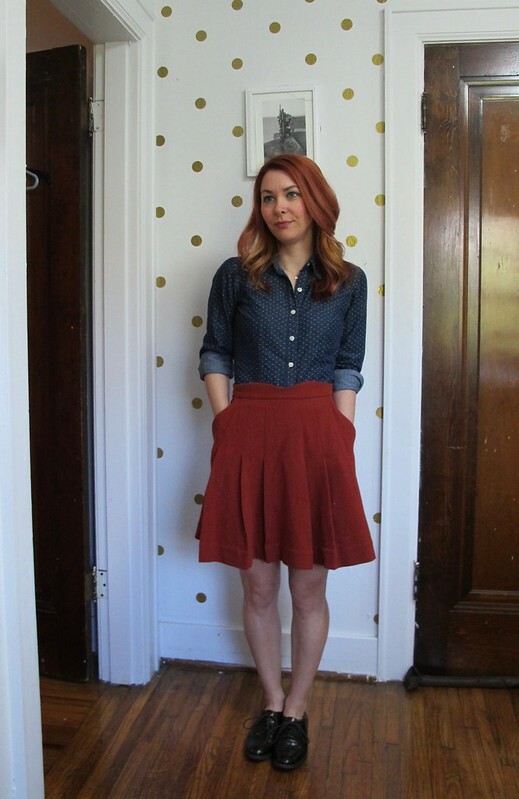 I forgot how much I love sewing + wearing wool crepe – my wardrobe has certainly taken a turn for the casual these days – but this skirt has definitely reignited that passion!